mmsonline.com October 2017 MMS 85 FEATURE R oughly three and a half seconds, or maybe a hair more. That's all it takes for a pair of dragsters to traverse a 1,000-foot Top Fuel circuit track, spewing flame and drowning out the din of cheering spectators as they blur past at speeds exceeding 330 mph. In these moments, precisely how many onlook- ers fully appreciate the engineering that goes into the se light we ight machine s is a nyone's guess. And yet, three and a half seconds is all it takes for critical engine components to fail. That's why the starting line isn't really at the racetrack for National Hot Rod Association (NHRA) teams; it's in the shop. In fact, keeping the cars running is d e m a nding e nou gh that th e s hop lite ra ll y travels with the team during the 10-month race season, with the same kinds of trucks that house cars and crew also transporting mills, lathes and other equipment. At more than 20 vehicles strong, the caravan of tractor trailers hauling Don Schumacher Racing (DSR) around the countr y is the largest in the Shedding Drag On and Off the Strip Setup-consolidating technology and strategies enable this race team to also bill itself as a full-fledged parts supplier. BY M AT T DA N FO R D NHRA. The home-base manufacturing operation in Brownsburg, Indiana, just outside Indianapolis, is more sizeable than most as well. Last year alone, DSR invested more than $7 million in new equipment and a 25,000-square-foot expansion, bringing the facility to a total of 145,000 square feet. At the time of this writing, engine blocks were the only significant components not produced in house, and plans were already in the works to start machining those parts, too. "We want to control our own technology and control our own costs," says Tom Warga, one of 14 machinists and one of the lead strategists for improvements throughout the shop. That goal is likely a familiar one to many North American manufacturing enterprises. Although winning titles is the primary aspiration of any race team, this 120-employee organization is a busi- ness like any other, and it faces similar pressures and challenges. Team owner and former driver Don "the Shoe" Schumacher certainly thinks this way, at least judging by his decision in 2013 to start selling parts to other teams as well. 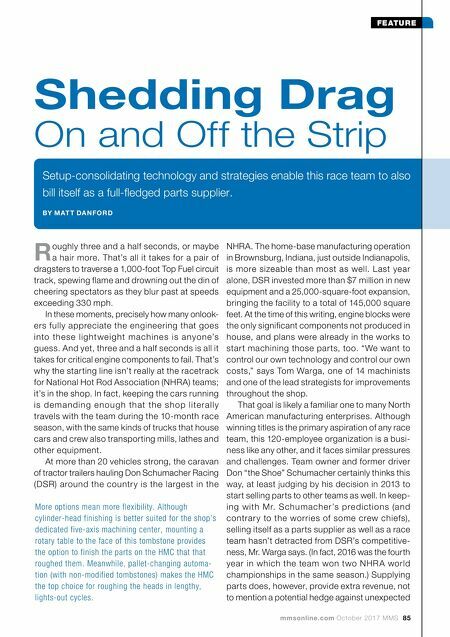 In keep- ing with Mr. Schumache r's predictions (and contrar y to the worries of some crew chiefs), selling itself as a parts supplier as well as a race team hasn't detracted from DSR's competitive- ness, Mr. Warga says. (In fact, 2016 was the fourth year in which the team won two NHR A world championships in the same season.) Supplying parts does, however, provide extra revenue, not to mention a potential hedge against unexpected More options mean more flexibility. 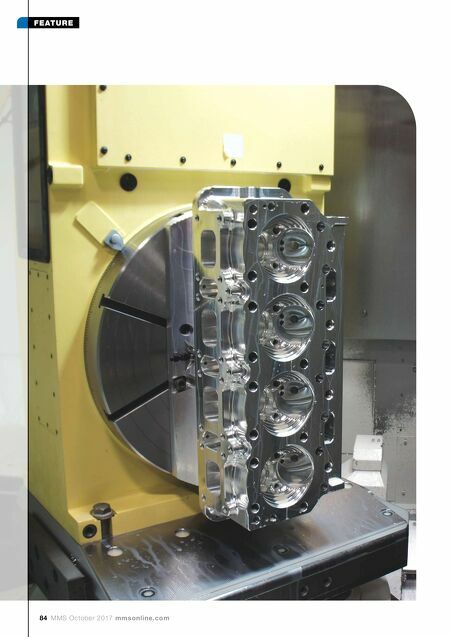 Although cylinder-head finishing is better suited for the shop's dedicated five-axis machining center, mounting a rotary table to the face of this tombstone provides the option to finish the parts on the HMC that that roughed them. Meanwhile, pallet-changing automa- tion (with non-modified tombstones) makes the HMC the top choice for roughing the heads in lengthy, lights-out cycles.